Giveaway! My way of saying thanks! As of yesterday, this little blog hit and surpassed 100 followers! I was so excited for this day, maybe more than I should've been! 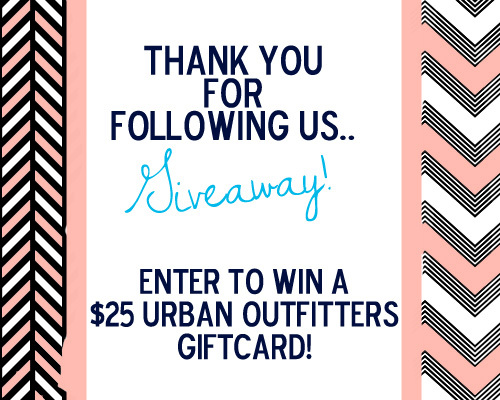 :) In any case, as my way of saying THANK YOU -- I will be giving away a $25 e-gift card to Urban Outfitters! Everyone loves Urban Outfitters, right? Enter to win below! To be qualified for this drawing, you must be a follower through GFC (the little tab on the right sidebar, click join this site.) You can get extra entries too by sharing with others and a few other ways as well. Best of luck to all of you lovelies that made this happen! Giveaway starts now and will be open through Sunday, July 1st -- Winner announced shortly after. P.S. I'm also over here giving away a goodie with some fab ladies! Yay! I just entered and am seriously crossing my fingers since I loooove UO and they are opening a new store just a mile from me. Thanks so much for the opportunity!! Fingers crossed! Thanks for hosting this giveaway and CONGRATS on your 100 followers! Can't wait until I make it there! Great giveaway!! I;m a new follower in need of some new clothes! I hope I win this!! Congrats on your success, Rachel. I know we'll be seeing lots more great things from you! Love this blog! I entered!